Kawasaki Heavy Industries Consumer Products and Machinery Company is the Consumer Products and Machinery production division of Kawasaki Heavy Industries. It produces Motorcycles, ATVs, Utility vehicles, Jet Ski personal watercrafts, General-purpose gasoline engines. Its slogan is "Let the good times roll!." Kawasaki's Aircraft Company began the development of a motorcycle engine in 1949. The development was completed in 1952 and mass production started in 1953. The engine was an air-cooled, 148 cc, OHV, 4-stroke single cylinder with a maximum power of 4 PS (2.9 kW; 3.9 hp) at 4,000 rpm. 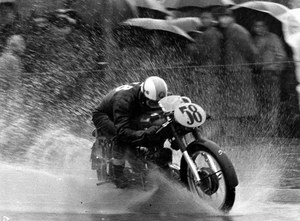 In 1954 the first complete Kawasaki Motorcycle was produced under the name of Meihatsu, a subsidiary of Kawasaki Aircraft. In 1960 Kawasaki completed construction of a factory dedicated exclusively to motorcycle production and bought Meguro Motorcycles. Kawasaki has since then become one of the world's major motorcycle manufacturers.